What is Kienbock’s Disease? Kienbock’s disease is a problem in the wrist caused by the loss of blood supply to the lunate. 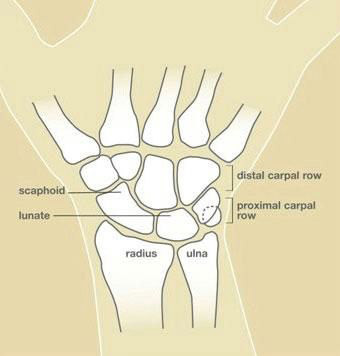 The lunate is one of the eight small bones that make up the “carpal bones” in the wrist (see Figure 1). There are two rows of bones: one closer to the forearm, the “proximal row;” the other closer to the fingers, the “distal row.” The lunate bone is in the center of the proximal row. It is next to the scaphoid bone, which spans the two rows. What causes it? There is probably no single cause for loss of blood supply to the lunate. The cause of Kienbock’s disease seems to involve multiple factors. These factors include the blood supply (arteries), the blood drainage (veins), and skeletal variations. Skeletal variations associated with Kienbock’s disease include a shorter length of the ulna, one of the forearm bones, and the shape of the lunate bone itself (see Figure 2). There may be some cases that are associated with diseases like gout, sickle cell anemia, and cerebral palsy. Trauma, either a single event or repeated significant trauma, may affect the blood supply to the lunate. In general, though, Kienbock’s disease is not felt to be related to occupational hazards. However, the presence of Kienbock’s disease can affect the treatment and prognosis for traumatic events. How is it diagnosed? Most patients with Kienbock’s disease present with wrist pain. There is usually tenderness directly over the lunate bone. The diagnosis of Kienbock’s disease is made by history, physical examination, and plain xrays. Special studies are sometimes also needed to confirm the diagnosis. Probably the most reliable special study to assess the blood supply of the lunate is Magnetic Resonance Imaging, or MRI. CT scanning, specialized CT scanning, and bone scan may also be used. What is its course? The progression of Kienbock’s disease is variable and unpredictable. Sometimes the disease may be diagnosed at a very early stage. At this time, there may be only pain and swelling, and normal xrays. As the disease progresses the xray changes in the lunate become more obvious. With further progression, the lunate develops small fractures and the bone fragments and collapses. As collapse occurs, the mechanics of the wrist become changed, which puts abnormal stresses and wear on the joints within the wrist itself. One should be aware that not every case of Kienbock’s disease progresses through all stages to the severely deteriorated arthritic endstage. What are the treatment options? Treatment options depend upon the severity and stage of the disease. In very early stages, the treatment can be as simple as observation or immobilization. For more advanced stages, surgery is usually considered to try to reduce the load on the lunate bone by lengthening, shortening, or fusing various bones in the forearm or wrist.Sometimes bone grafting or removal of the diseased lunate is performed. If the disease is very advanced and the relations of the bones one to the other have markedly deteriorated, complete wrist fusion may be the treatment of choice. Hand therapy does not change the course of the disease; however, hand therapy can help to minimize the disability from the problem.Treatment is designed to relieve pain and restore function. Your hand surgeon will advise you of the best treatment.Your hand surgeon can explain the risks, benefits, and sideeffects of various treatments for Kienbock’s disease. What can I expect? The results of Kienbock’s disease and its treatment vary considerably depending on the severity of the involvement, and whether or not the disease progresses. The disease process and response to treatment will take several months. On occasion, several forms of treatment, and even multiple operations, might be necessary. Download a PDF of this content.